THE IMPRINTING FOUNDATION: Its Origins Dedicated to the development and extension of new technologies promoting sustainable agriculture and ecological restoration This is a brief history of the no-tillage method of planting & seeding called land imprinting. This method, invented in 1976, is the first uniquely new approach for large scale seeding and planting developed in the past 3 centuries after Jethro Tull invented the seed drill in 1702. 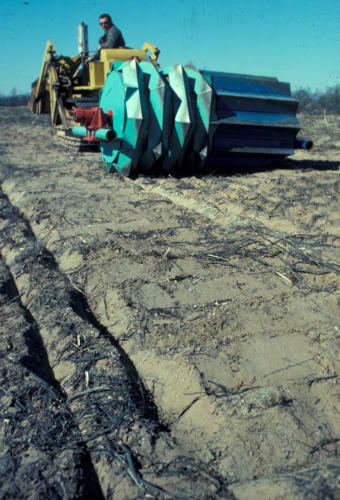 Unlike the Tull drill and similar developments during the past several centuries, the imprinter does not make continuous furrows that tend to bleed land resources downslope when water arrives at the air-earth interface (AEI) in the form of rainfall, snow melt and irrigation. These continuous furrows, and often the need for pre-drill tillage, make the Tull-type drill an unsustainable cultural practice due to accelerated water runoff and soil erosion, especially on sloping land. Tombstone Prototype In contrast, Imprinters make staggered V-shaped pockets, one-square-foot in size, that funnel resources together in the bottom of the Vee where they can work in concert to germinate seeds and establish seedlings using a minimal amount of water. Imprints are formed by vertical and lateral forces acting on V-shaped steel teeth welded to the surface of a steel roller in a staggered pattern. The teeth wedge their way into the soil surface. 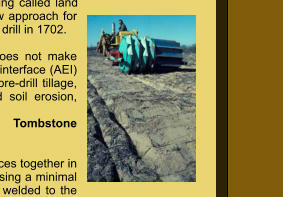 Imprinters are based on AEI research that found that the two main properties controlling water infiltration into dry soils were AEI micro roughness and macro-porosity. Land imprinting was developed to control these two properties at high levels with minimal soil disturbance. Finally, land imprinting excels at holding soil and water resources in place for seed germination, seedling establishment and plant growth. Land imprinting specifications have been recently established for achieving sustainable agriculture and ecological restoration of degraded land. These specifications will be updated periodically because land imprinting is a work in progress indefinitely into the future. THE IMPRINTING FOUNDATION: Its Origins Dedicated to the development and extension of new technologies promoting sustainable agriculture and ecological restoration This is a brief history of the no-tillage method of planting & seeding called land imprinting. 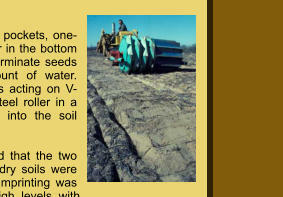 This method, invented in 1976, is the first uniquely new approach for large scale seeding and planting developed in the past 3 centuries after Jethro Tull invented the seed drill in 1702. Unlike the Tull drill and similar developments during the past several centuries, the imprinter does not make continuous furrows that tend to bleed land resources downslope when water arrives at the air-earth interface (AEI) in the form of rainfall, snow melt and irrigation. These continuous furrows, and often the need for pre-drill tillage, make the Tull-type drill an unsustainable cultural practice due to accelerated water runoff and soil erosion, especially on sloping land. Tombstone Prototype In contrast, Imprinters make staggered V-shaped pockets, one- square-foot in size, that funnel resources together in the bottom of the Vee where they can work in concert to germinate seeds and establish seedlings using a minimal amount of water. Imprints are formed by vertical and lateral forces acting on V- shaped steel teeth welded to the surface of a steel roller in a staggered pattern. The teeth wedge their way into the soil surface. Imprinters are based on AEI research that found that the two main properties controlling water infiltration into dry soils were AEI micro roughness and macro-porosity. Land imprinting was developed to control these two properties at high levels with minimal soil disturbance. Finally, land imprinting excels at holding soil and water resources in place for seed germination, seedling establishment and plant growth. Land imprinting specifications have been recently established for achieving sustainable agriculture and ecological restoration of degraded land. These specifications will be updated periodically because land imprinting is a work in progress indefinitely into the future.